Westminster Public Schools (WPS) has joined other Adams County school districts in adding a two-hour delayed start as an option on days when snowy weather conditions make for a dangerous morning commute. In the past, WPS closed the district and schools for the entire day. On days where a delayed start is called, the formula is simple — add two hours to all bus and school start schedules, and dismissal times will remain the same. See the guidelines for a delayed start to the right. As always, parents have the final say on whether they want their children to travel to school on inclement weather days. Early Learning Center will begin at 9:15 a.m. Note: This will not be custodial staff, who will be needed to prepare the building for student and staff arrival. How will I be notified of a delayed start? The decision to close schools or to open with a delayed start will be communicated as early as possible, but no later than 5:30 a.m. 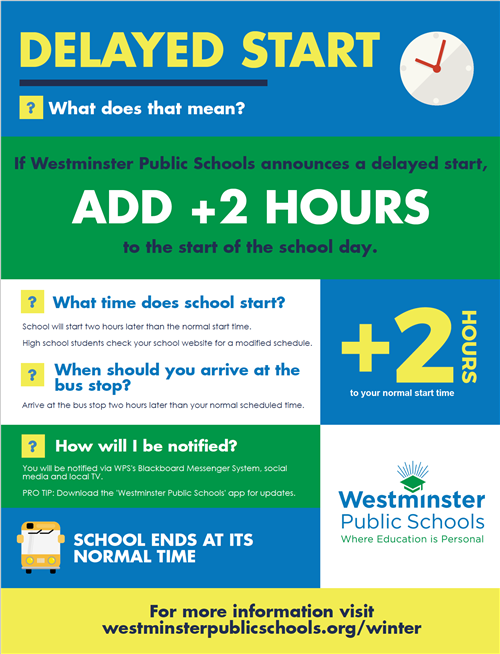 If the decision is made for a two-hour delayed start, but worsening weather requires the closure of schools, an announcement will be made by 8 a.m.
As in the past, parents and employees will receive a phone call in the early morning, and information will also be shared with local TV stations and posted on the WPS and all school social media pages. It is important for schools to have accurate contact information for all families and employees. If your phone number or email address changes, please share that information with your school's main office as soon as possible.